Glass, paper, ceramic, or plastic containers are used in microwave cooking because microwaves pass through these materials. Although such containers cannot be heated by microwaves, they can become hot from the heat of the food cooking inside. The U.S. Department Of Agriculture also offers a brief guide, but also nothing beyond what seems obvious: Avoid plastic containers unless it’s marked microwave-safe. Don’t let plastic wrap touch your food. Don’t microwave brown paper bags, grocery plastic bags, or newspapers. 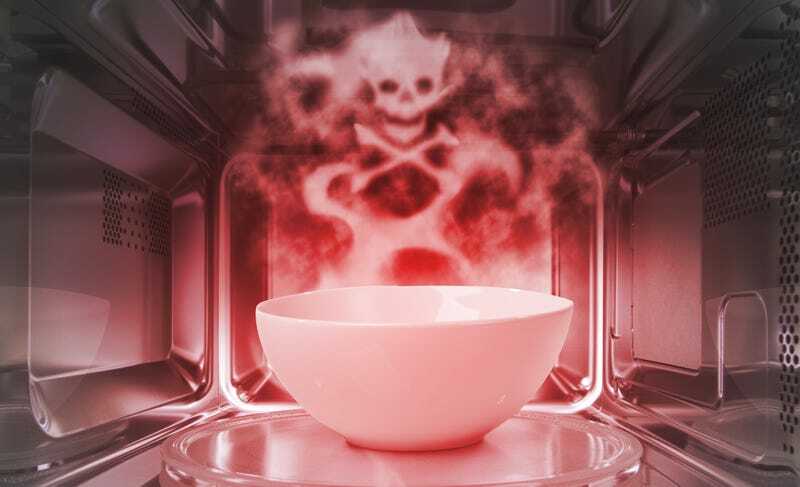 Still it begs the question: What does it mean for cookware to be microwave safe? Is it simply about temperature—a bowl that you nuke and won’t burn the bejesus out of you? Or is it more a food safety issue, such as chemicals leaching out? Enter Takeout “Food Science” contributor David McCowan to the rescue. While he emphasized that he was answering my questions as a physicist, not a food scientist, he still had plenty to offer. The key isn’t what makes microwaving food safe. It’s what makes it unsafe. “I don’t know what the product engineer’s answer would be, but microwave-safe to me means that the material when used in the microwave will not break or deform, become too hot to handle, give off dangerous chemicals into the food or air, or cause damage to the microwave,” he revealed via e-mail. Why do sausages scream and explode in the microwave? Because most containers aren’t watery, they aren’t heated directly by the microwave, he explains. It’s the food that heats the containers up. That’s true of plastic, metal (provided the surface is smooth, large, and un-crumply), paper… you get the idea. So why aren’t all non-crinkly-metal containers designated microwave-safe? “The line is a little less clear when a material will itself get warm or will warp in the microwave. Styrofoam, for example, does not get directly heated in the microwave (since it contains no water), but certain forms are soft enough that they can melt (or at least deform) from indirect heating as the hot food inside transfers its heat to the container.” He also mentions that some ceramics contain residual water, meaning the dish itself could heat up, creating a burn hazard. If the material could leach stuff into the food, like melamine, it’s M.U.S. Soft plastics might break down over time, and certain decorative paints could potentially flake off when heated. Metal in general is a bad idea, so watch out for decorative metal bands in teacups and other things. While in theory, a very smooth metal bowl “with no sharp lip” would be safe, “the line between smooth and pointy is continuous... most metal containers fall ambiguously in the middle.” M.U.S. If the material could heat up itself, like the aforementioned ceramics or something covered in a paint or glaze that heats up, that’s bad M.U.S. news. The M.U.S. material could bubble, melt, or become otherwise deformed, when heated indirectly by the food. That means we have an answer to the question. Doesn’t contain metal that’s even moderately sharp-edged. For cookwares that aren’t marked, there’s a test from the website of GE Appliances to see if a particular utensil or dish is microwave-safe: Fill a cup with water, and place it alongside the cookware in question inside a microwave. Heat for a minute on high. If the water gets hot and the cookware stays cool, it’s safe to use. If the cookware gets hot, well, don’t put it in the microwave again. Alternatively, McCowan suggests you can also fill the container in question with water and placing it in the microwave for 30 seconds. That’s not enough time for the water to heat up the dish, so if the dish is warm, that’s a bad sign. “If it’s still cool after a full minute of warming, then it’s probably okay.” Just don’t heat it too much, because super-charged water is terrifying.